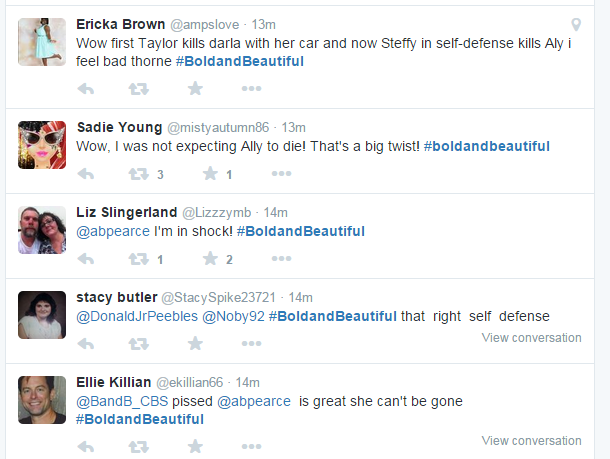 Today’s “The Bold and the Beautiful” Sent Us to the Home! I just cannot believe it. I really cannot believe it! In today’s episode of “The Bold and the Beautiful,” I literally was not only on the edge of my seat, but I got so angry that only a fan would understand my plight. For those that have not watched the episode today, stop reading right now, because there are some massive spoilers ahead. Continuing with Steffy and Aly’s confrontation, Thorne returns home to the Forrester mansion, and everyone tells him about how unbalanced she had become within recent months. Ivy is on her way to try to find both Aly and Steffy, only to find the two of them coming to blows….literally. After unsuccessfully trying to bludgeon Steffy with a tire iron, Aly then tries to bludgeon her with a rock instead. Aly takes notice of Steffy reaching for the tire iron. Aly falls back when trying to swing, only for her to hit her head on a rock! Aly is unconscious, and Steffy and Ivy try to revive her. Thorne is taking everyone’s advice on how to help Aly, including taking her back with him to Paris to run Forrester International. He begins setting up appointments for Aly at a doctor’s office, and Liam and Wyatt feel as if there is nothing to worry about. The ambulance arrives to help Aly, Steffy and Ivy. Unfortunately, it is too late. They tell them both that Aly did not survive, and has been declared dead. The show ends with both Steffy and Ivy breaking down in tears. I am seriously in awe over today’s turn of events…and it’s only THURSDAY! What a fantastic week so far of shows. 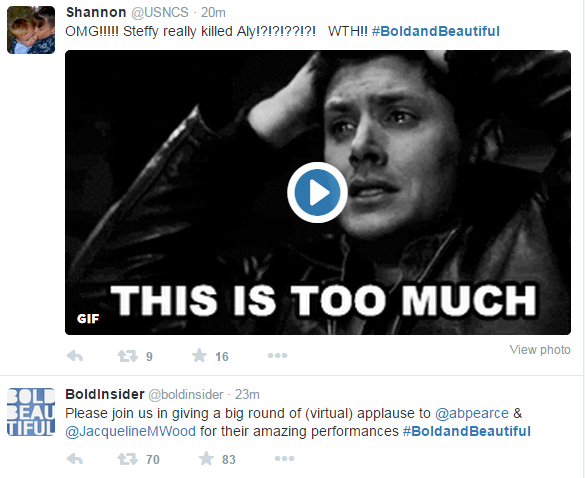 This, however, marks the end of Ashlyn Pearce’s two year run as Aly Forrester on the CBS Daytime soap. We will miss her portrayal of the character, as she has done a remarkable job. What a fantastic actress, and we hope to see you soon elsewhere. 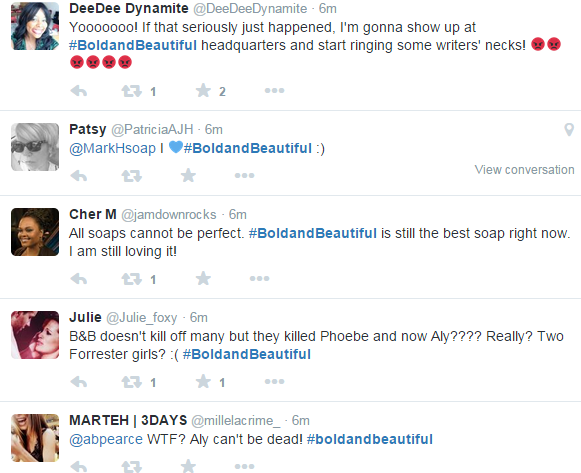 “The Bold and the Beautiful” has definitely been bringing back the suspense to daytime. So many surprises have happened this year alone that has many people talking. Back in March, Maya Avant was revealed to be born Myron, and this storyline has been wonderful and intelligently written. Karla Mosley and Jacob Young are doing a great job bringing this story to the forefront as well as awareness to transgender/LGBT issues. Now…THIS! THIS twist sent me spiraling out of control. And some Twitter fans also have been showing their upset. SOUND OFF, fans and friends. What did you think of today’s episode? Ding song the witch is dead. Yeah!